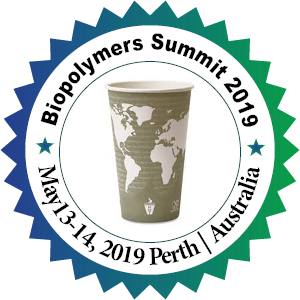 ConferenceSeries Ltd invites you to attend the 9th World congress on Biopolymers and Polymer Chemistry going to be held on May 13-14, 2019 at Perth Australia. The main theme of the conference is “Functional Biopolymers as new Advanced Materials”. Biopolymers and polymer chemistry 2019 World congress is an attempt to explore the various ways to utilize natural resources for betterment of the future, promising a better tomorrow for the progeny and a better vision for the springing research. Polymer chemistry and Biopolymers conferences is anticipated to be one of the best scientific conferences in Asia and Australia. The scientific sessions of this International Conference on polymer chemistry and Biopolymers conferences has been designed on vivacious topics such as Biomaterials and Biopolymers, Green Chemicals, Industrial Biotechnology, Micro and Nano blends based on natural polymers. Biopolymers conferences is consisting of well-organized scientific program and effervescent speeches by the expertise. ConferenceSeries Ltd Organizes 300+ Conferences, 500+ Workshops and 200+ Symposiums Every Year on Pharma, Medicine, Science and Technology across USA, Europe & Asia (conference series) with support from 1000 more scientific societies and Publishes 400+ Open access journals which contains over 30000 eminent personalities, reputed scientists as editorial board members. ConferenceSeries LLC Ltd conferences always encourage the young researchers and students to share their excitement and enthusiasm with world class expertise. Biopolymers and polymer chemistry is an event delivering the concept of bio based world across the globe. In the present world where the use of conventional plastics, the consequences of plastic products use and the waste management of these products when they become waste, is a current and pressing issue. Concerns focus on the potential impact of conventional plastics they cause to the environment.